Attended the circus with her brother Raymond and their father John O'bright, and they sat in Section S, eighth row, between seats 11 and 16. Attended the circus with his two children, Joan and Raymond, and John's friend Walter Paskus and his wife and daughter. and they sat in Section S, eighth row, seats 11 and 16. John saw a 2-foot wide flame shoot up on the inside of the tent, about 10-fet from the main entrance, seemed to come from underneath the seats. The flames funneled out as they spread above the bleachers. John and his group couldn't go down because of the crowd, so they went up to the top of the seats and slid down a pole. Attended the circus with his sister Joan and their father John O'bright, and they sat in Section S, eighth row, between seats 11 and 16. Attended the circus with his sister-in-law, Annie Burns, his grandchildren Robert and Doris Jean O’Connell, and his daughter-in-law Eveline O’Connell. 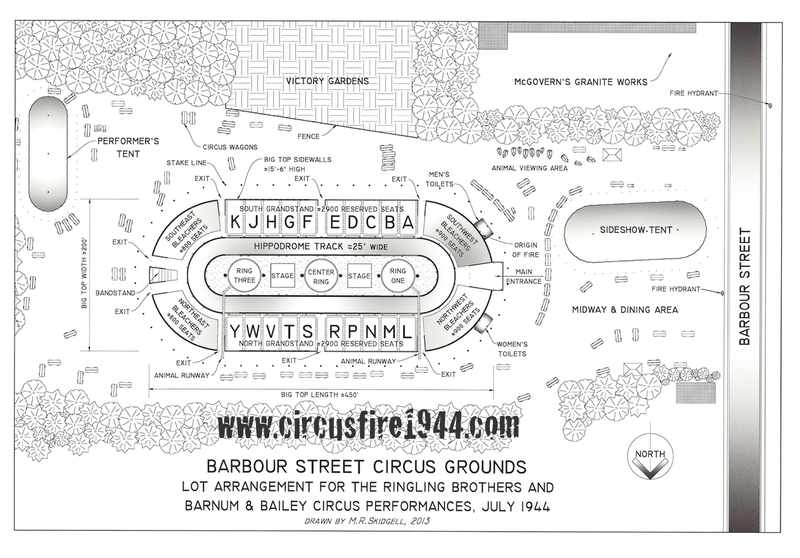 The group sat in the northeast section of the big top, section V or W, and became separated when trying to escape from the burning tent. Eveline and Doris Jean were found dead at the circus grounds, Annie Burns was found severely burned and later died from her injuries. Daniel and his grandson Robert were able to escape with their lives. Attended the circus with his mother Eveline O’Connell, his sister Doris Jean, his great-aunt Annie Burns and his grandfather Daniel O’Connell. The group sat in the northeast section of the big top, section V or W, and became separated when trying to escape from the burning tent. Eveline and Doris Jean were found dead at the circus grounds, Annie Burns was found severely burned and later died from her injuries. Six-year-old Robert O'Connell and his grandfather were able to escape with their lives. Robert received burns on his hand and arm, and was awarded $1,050 by the arbitration board. Interviewed by WTNH News Channel 8 on July 6, 2005 at the dedication of the monument. Attended the circus with her friend LeAnn Dressler and LeAnn's parents and sister. All escaped without injuries. Read LeAnn Dressler's story here: Personal Accounts - Page 8. Sat with his party in Section H, row 1, seats 13 to 16. Just as the first act near their seats was finishing, Robert noticed a cone of fire to his left, going up the canvas sidewall until it reached the roof and then it spread. People began running and he grabbed his youngster and they went out the exit at the east end. Mr. Onorato took 8mm film footage from this location. Attended circus with an aunt and uncle, and they all escaped.